I was so shocked to hear that Cherie, who often came to my classes and had booked to be with us on Sunday, sadly passed away last week after the aggressive return of her illness. I'd met Victor, her husband about three weeks ago when he called to pick up the last kit for the class Cherie had booked but missed due to treatment. On Sunday, Victor asked if I would complete the two projects for him that Cherie would have made, and could I make the roses a specific colour. 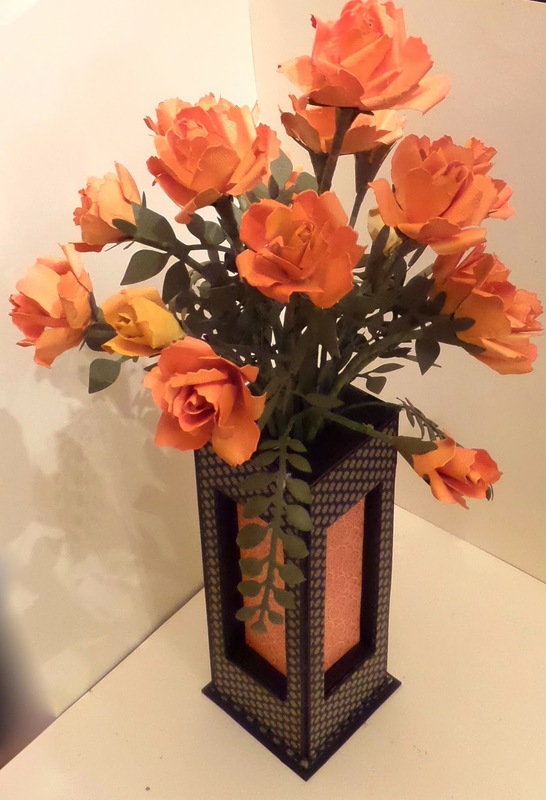 So I've put my to do list on hold for the last couple of days and made the vase of flowers above, just like the ones in the picture, using buttercup card stock, red and orange pan pastels and the Tattered Florals die. 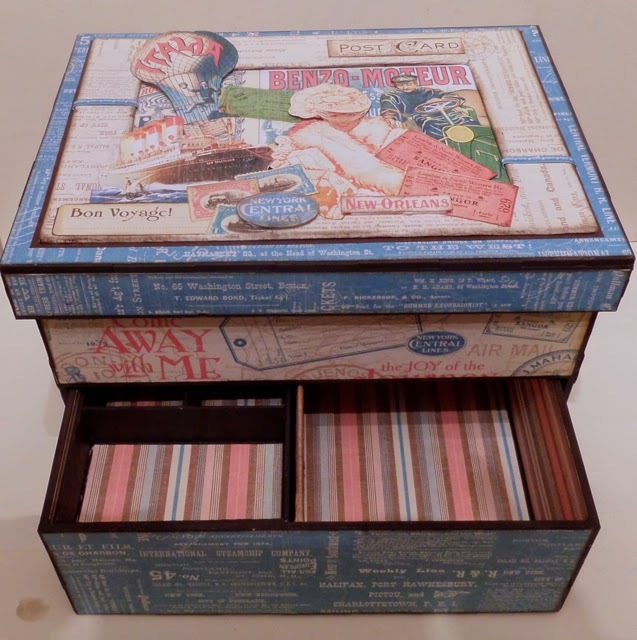 I've also completed the Come Away with Me A5 Box with drawer below and am taking them over and to Daisy's tomorrow for Victor to collect. It was so sad making these projects and my thoughts were with Victor and his family while I crafted away. Oh Clare, I am so sorry for the loss of your friend. Thoughts and prayers are with her family. How kind of you to do this for her husband. I knew something was up because you hadn't been on here for awhile. She is at peace and looking down at you all and loving the flowers you made. Take care my friend. That's so sad, but I'll bet she's crafting away in Heaven. :-) Clare, that is so wonderful that you're able to do that for her husband. Sorry for you lose of your friend Clare, but you have a stunning vase with roses and a gorgeous box. 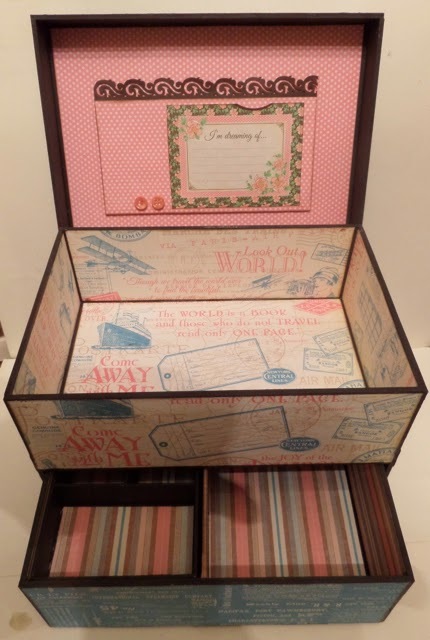 Morning Clare, Such very sad news to read today, Cherie is now in 'crafting heaven', and how lovely of you to complete her projects, I can understand that you would be 'in bits' whilst doing them. They look absolutely gorgeous, and Victor will have such a lot of gorgeous projects to treasure. My thoughts and prayers are with Victor, and all Cherie's family and friends. Clare, I'm so sorry for your loss. I hope that the projects you completed for Victor will bring him some comfort knowing they were completed with so much affection. Rest in peace, Cherie, you and your family are in my prayers. Apologies, I should of course have said her husband (not your). I just wanted to say a very big thank you for completing the projects that Cherrie would have done in you workshops at Daisy Jewels. The pictures above don't really do them justice as they are absolutely brilliant. Cherrie was really passionate about her craft work and I hope that at some point in the not to distant future to post some of her work online somewhere for everyone to enjoy. Although I am obviously biased, I think she created some stunning work. My life will never be the same without her but having the beautiful things that she created around me is comforting. Thank you once again, and thanks also to those above for their kind words.